Two people from Indiana were transported by Careflight following a crash Friday evening. 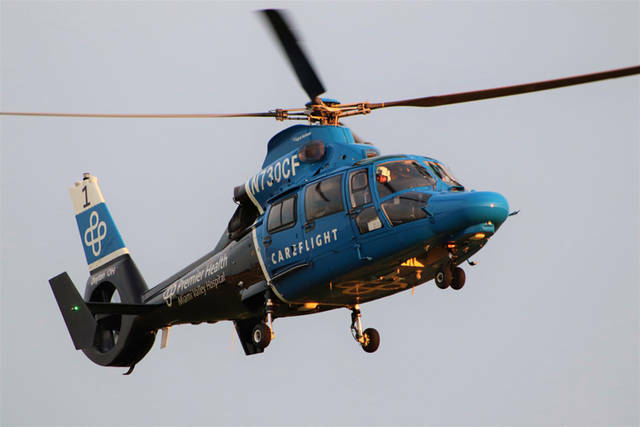 DARKE COUNTY – An out-of-state driver and his passenger were critically injured and flown to Miami Valley Hospital after they were involved in an accident with injuries. At approximately 7:20 p.m. Friday, numerous emergency crews from area departments were dispatched to the intersection of U.S. Route 127 and State Route 503 in regards to an accident with injuries with an entrapment. New Madison Fire, Arcanum Fire, Tri-Village Rescue, Arcanum Rescue and Greenville Township Rescue along with deputies from the Darke County Sheriff’s Department all responded to a two-vehicle accident. 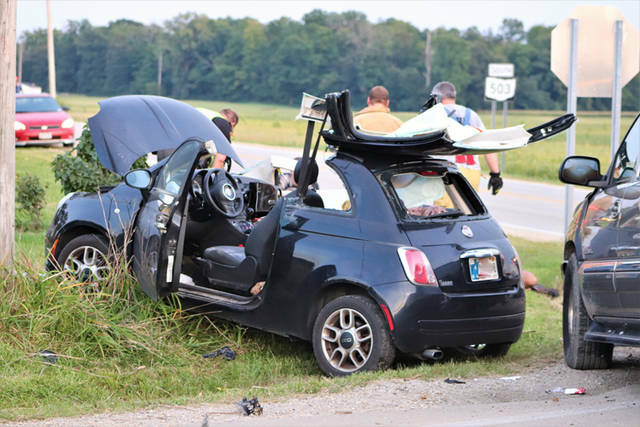 According to the Darke County Sheriff’s Department, preliminary investigations have revealed that a black 2012 Fiat, driven by 27-year-old Brenten Peters of Upland, Indiana, was traveling Southbound on U.S. 127 when he attempted to turn southeast onto State Route 503. 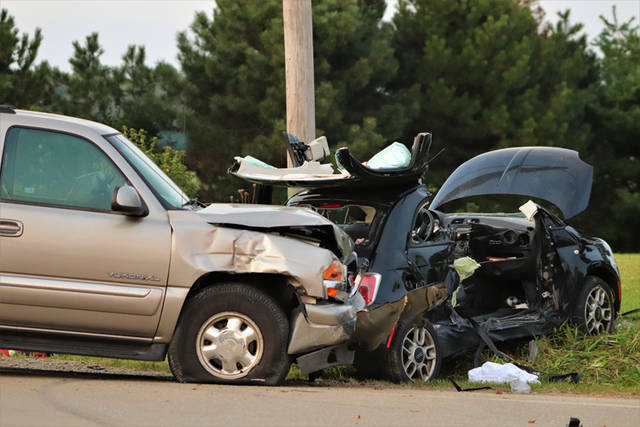 Peters pulled into the path of a tan 2000 GMC Yukon, driven by 55-year-old Jodi Turner of Arcanum, causing the two vehicles to collide and travel off the roadway. Peters’ front seat passenger, 25-year-old Elizabeth Riley of Marion, Indiana, was mechanically extricated from the Fiat and treated on the scene before being transported to Miami Valley Hospital by CareFlight. Peters also was treated at the scene for his injuries before being transported to Phillipsburg Airport to be met by and transported to Miami Valley Hospital by Medflight. Both driver and passenger are listed in serious condition at Miami Valley Hospital as of Saturday morning. Turner, the driver and sole occupant of the Yukon, was treated on the scene for minor injuries before being transported to Wayne HealthCare in Greenville. Personnel from the Darke County Animal Shelter also were called to the scene to assist in the care and removal of a small dog that was found in the Fiat. The animal will remain in the care of the shelter until it is able to be claimed. The accident remains under investigation by the Darke County Sheriff’s Department. This entry was tagged Arcanum Fire, Arcanum Rescue, Careflight, crash, Darke County Animal Shelter, Darke County Sheriff’s Department, Greenville Township Rescue, Miami Valley Hospital, New Madison Fire, Tri-Village Rescue, Wayne HealthCare. Bookmark the permalink.